Short-listed for the $25,000 Lenore Marshall Poetry Prize, awarded by the Academy of American Poets. 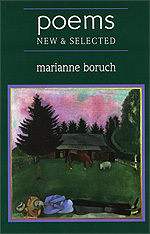 Marianne Boruch is the author of four previous collections of poetry: Moss Burning and A Stick That Breaks and Breaks, both published by Oberlin College Press, as well as Descendant (1989) and View from the Gazebo (1985). The director of the graduate program in creative writing at Purdue University, Boruch's complex and compelling poetry astonishes with its precision, depth, and lucidity. "Ever since her first book, Marianne Boruch has been among our most formidable and thought-provoking practitioners of poetry. It is not that she is flamboyant or flashy, armored in theory or swimming with a school. Her poems are contained, steady, and exceptionally precise. They build toward blazing insights with the utmost honesty and care. How, we wonder, did she accomplish that so effortlessly? And the answer arrives not far behind: through attention, craft, integrity, and vision." we've been in these woods. not gently, hard against him. anything. Dear boy, go home. Go home, where you left your longing. Copyright c 2004 by Marianne Boruch. May not be reproduced without permission.